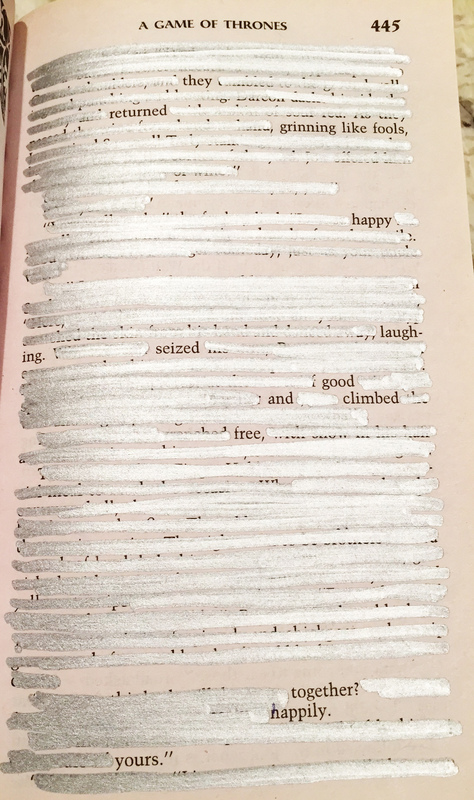 Today’s Prompt: Black Out Poetry: Grab the nearest broken book to you, a new Sharpie or pen of your choice, and make new poetry out of ONLY the words on the page. This was interesting – I’ve always wanted to do this, and so I grabbed the book, opened to a random page, and this came to life. It ended up being fitting, considering what today is all about. Happy Valentine’s Day, readers. I both love this so much and am crazily surprised that you would do that to a GoT book bahaha.